Here you can find all information about the cannabis breeder DutchFem. We've collected data about 28 Cannabis Strains breed by DutchFem. Click on the strains to find more informations, pictures, reviews, comparisons and sources for a variety - and/or check out the Breeder Info here at the page to find out more about DutchFem. Its also possible to visualize all DutchFem strains together with all their Parents or Hybrids with our dynamic maps - check it out! Click here to visualize all DutchFem strains including all known hybrids and descendants with our dynamic map! Here you can watch all DutchFem strains and their ancestors (sorted by origin) with our dynamic strain map! DutchFem is a new company in Europe. Afters years of experience with marijuana seeds in The Netherlands, we have decided to start our own cannabis seed company. 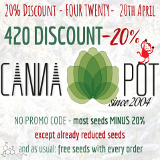 With this we can offer you our own cultivated, feminized, autoflower and medicinal cannabis seeds of upmost quality. Like you've probably noticed, there is a large selection of seeds: Skunk, Cheese, Haze, Big Bud, Amnesia, Kush, Chronic, AK, Mazar, Power Plant, NLX, White Widow, Northern Light, Critical and so on. Besides that there are a lot of namings for cannabis like: weed, wiet, ganja, kaya, mary-jane, marihuana, etc. Because of this, making a choice can be difficult. That's why we at DutchFem chose for a clear overview from cannabis seeds, tested by us. We stand behind the genetics and quality of our supply cannabis seeds.